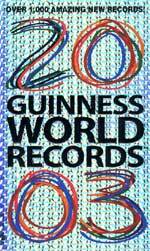 Published in May this year, the Bantam Books paperback edition of the Guinness World Records 2003 (ISBN 0-553-58636-X) is here now. It bills itself as "the most complete, authoritative and exciting guide to every record, statistic and feat of human endeavour and natural wonder imaginable." The book is divided into sections, with "every record, statistic and feat of human endeavour and natural wonder" some of which are definitely of interest, whilst others are merely public loopiness. Human achievements are first off, and while I was enthralled by some of the feats of endurance such as Vesna Vulovic who, without a parachute, survived a fall of 33,000 feet, or the real life actions of heroes and lifesavers; but the fact that B. D. Tyagi of India has 4 inch long ear hairs or that Thomas Wedders of the UK has a 19 cm nose, has me totally underwhelmed. Other categories include nature, society and politics, objects, planes, trains and automobiles, buildings, military service, technology, entertainment and sports. Being interested in dinosaurs, I did glean some new facts, including the fastest dinosaur could lope along at an amazing 40 kph, and that researchers had found some 160 million years old dinosaur vomit, which shows that you should always clean up after yourself, you don’t know who may discover it! In the entertainment section I was interested to find that John Lennon recorded and produced music under 15 pseudonyms during his lifetime. Unfortunately the book does not tell you what they were. In the pure science section is the data surrounding the two chemicals ethyl mercaptan and butyl sereno-mercaptan which smell of a combination of rotting cabbage, garlic, onions, burned toast and sewers. And you think you’ve got halitosis! However, for most readers, it seems that the fact that a Kim Goodman can pop her eyeballs out 11 mm, and other such non-events are the most fascinating. Oh dearie me! The review copy was made available by Bookazine and had an RRP of 350 baht. Whilst I have no intention of getting into a fight with the Guinness World Records people, there would be those who would claim that Vanessa-Mae, the "Youngest violinist to record both the Beethoven and Tchaikovsky concertos" is Thai and not from the UK, and the largest car engines of 13.5 litres in vehicles which were built in 1912 are not all that exciting, according to Automania’s Dr. Iain, considering the 1902 Panhard-Levassor also had an almost 14 litre engine, and all of them are eclipsed by the 21 litre Metallurgique of 1910. However, the book says that if you think you’ve heard it all, you probably haven’t heard that the world’s fastest computer can do 35.6 trillion calculations every second. What it doesn’t tell you is how many times it crashes every day or carries out an "illegal operation" and shuts itself down. The 2003 edition of the Guinness World Records remains a tribute to lunacy, so if you want to know what the nutters of the world were up to last year, this is the definitive book for you! But not for me! In 1984 Aerosmith had gone from being one of the biggest bands in the world to a complete Rock ‘n’ Roll disaster area. Sales had hit an all time low and live performances were erratic to say the least; the results of living the life of Riley to the max. The last album by the original lineup had been a patchy affair ("Night in the Ruts" 1979), after which both guitarists, Joe Perry and Brad Whitford, left the band to eventually be replaced by Rick Dufay and Jimmy Crespo. Both were very talented musicians, but their own lifestyle was never going to be a good influence on frontman Steve Tyler. The band staggered back onto the road and even managed to produce an album, ‘Rock in a Hard Place’ in 1982. Perhaps the least said about it the better, it included a version of the easy listening classic ‘Cry me a River’, which was so full of pathos it nearly exploded. But by late 1983 things had got to the point where some band members were sleeping on friends’ floors, Joe Perry’s solo career had gone off the rails big time, Brad Whitford’s new band with Derek St. Holmes had released one album to commercial indifference and critical ridicule, what remained of the band was in tatters. Then old time fan and managerial genius Tim Collins came along and picked up the reigns. Bridges were built and at the first meeting of all the original players and management team, it was decided that if things were going to be put to rights it had to be done properly, in other words straight. A period in rehab was diagnosed after which even alcohol was banned in the studio or backstage at the concerts. A new recording contract was signed with Geffen Records and the band went out on the road to get used to being a band again. The first new release from the band, "Done with Mirrors" 1985, was not a success, a good album, but somehow missing that Aerosmith spark. So yet again Aerosmith were written off. Fate dealt Aerosmith a wonderful hand when American Rap stars ‘Run MC’ asked Joe Perry and Steve Tyler to join them in the studio to record a Rap version of one of Aerosmith’s earliest hits "Walk this way". Once this was released and was a huge hit single worldwide on the back of massive airplay from MTV, Aerosmith had one more chance. However, they knew it was now or never. The whole band relocated to the Little Mountain Sound Studios in Vancouver. The management brought in a new producer to replace Ted Templeton. Richard Fairbairn was first choice and accepted the job. Richard Fairbairn was really hot at the time, having just come off producing the multi platinum "Slippery when Wet" for Bon Jovi. Desmond Child and Jim Vallance were also brought to the studio to help out with the songwriting side of things. This time Aerosmith fired on all six. 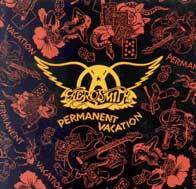 Preceded by a hit single in the band’s own right "Dude (Looks Like a Lady)" which again got heavy MTV play listing, the album "Permanent Vacation" was a massive hit worldwide - the boys were back in the saddle. This is Rock ‘n’ Roll at its best, make no mistake. Right from the opening song "Hearts done time" when Bradford and Perry’s guitar battle it out mid-song, to all the hit singles, including the power ballad "Angel", which still has enough grungy Perry guitar riffs to not make you feel too wimpy as you sing-along. 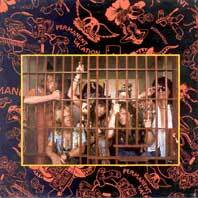 Steve Tyler’s "St. John" is probably the sleaziest song ever recorded by the band. If this song doesn’t make you swagger, nothing will. The one cover version is a storming version of ‘The Beatles’ "I’m Down", which thunders out the speakers with Tyler contributing a marvelously over the top piano solo. Throughout every song Hamilton and Kramer lay down a rock solid groove, which carries you along from one to the next without skipping a beat. Album closer "The Movie " is a Joe Perry instrumental, broody and atmospheric, every home should have one. From this point on there was no stopping Aerosmith, but it was close to disaster - talk about living on the edge.